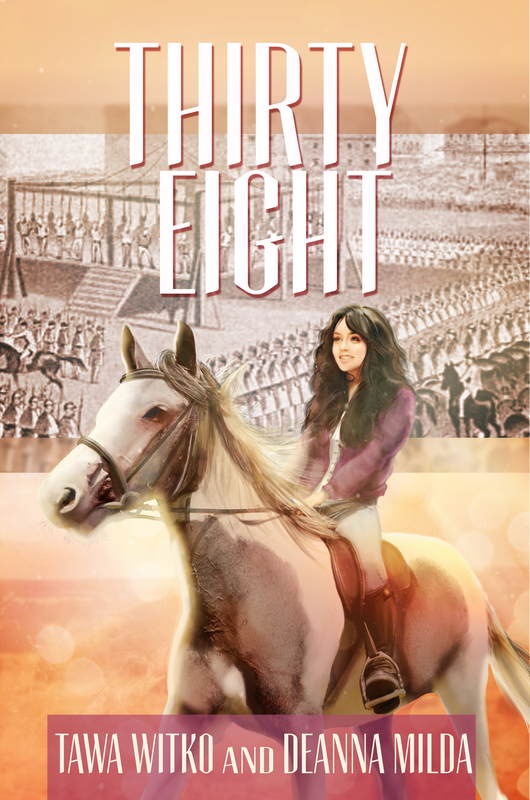 Winyan Press is proud to reveal the new cover for authors Tawa Witko and Deanna Milda’s debut novel Thirty Eight. The story follows a young woman as she rides to honor her father and her ancestors. The picture created by Alex Marin represents the hanging site of the 38 Dakota warriors, in addition, the horse which Viviana rides represents author Deanna Milda’s own horse, Eagle Bear. Alex has once again delivered an exceptional cover. Viviana lived a quiet life in the city, studying and doing everything possible to ensure she was accepted into a good college. She never thought much about who she was or where she came from but all of that will change when her father dies in the line of duty and she is asked to do something she never thought imaginable, participate in the annual Dakota 38 + 2 Ride. It was something that absolutely terrified her but with the encouragement of her uncle and the guidance of her new friend, Dre, she will discover something within her she never knew existed and she will learn that culture and tradition live within one’s heart and cannot be easily forgotten. Our spirit remembers our ancestors and beckons us to them, even if we are reluctant to go. Thirty Eight is a story of acceptance and love while finding one’s way back home. This entry was tagged Cover Reveal, Deanna Milda, Tawa Witko, Thirty Eight. Bookmark the permalink.